Saudi Aramco celebrates 75 Years of Excellence at the Grand Event Tuesday, May 21st. Saudi Arabia's beloved King Abdullah bin Abdul Aziz Al Saud, the sixth king of Saudi Arabia, visited Dhahran to take part in Saudi Aramco’s 75th anniversary celebrations. As part of the 75th celebration, Saudi Aramco invited the children of Aramco employees who shook hands with King Abdul Aziz ibn Abdur Rahman ibn Faisal al Saud on his visit to Aramco in 1947. Thirty children, along with their spouses, siblings and children attended the festivities as honored guests of Saudi Aramco. A reenactment of the original event was conducted with current employees, wives and children living and working in Dhahran. 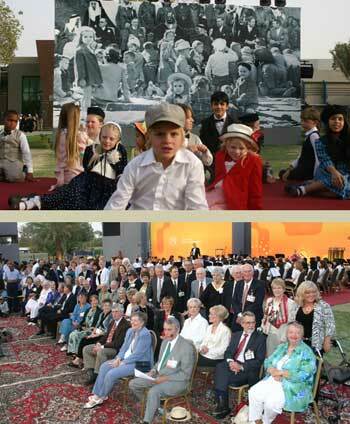 The children were seated on a large carpeted stage in front of an enormously enlarged photograph of the actual 1947 Children. As the celebrated 1947 young residents walked by the photograph, many stopped for another look at their youthful appearance 61 years ago. The admired King Abdullah was cheered by the crowd as he waved, blew a kiss to the multitudes and danced the traditional sword dance with the troupe. 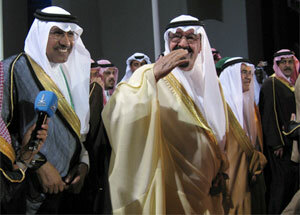 View King Abdullah's visit on video.